On December 4th, 60 Minutes aired a 13 minute story on “drive by lawsuits” under the Americans with Disabilities Act. The segment, which followed a puff piece on Paul Ryan, questioned lawsuits filed by three lawyers, two of them being sued by their disabled clients for malpractice. Anderson Cooper, the show’s host, did not mention a single ADA lawsuit he thought was valid, a single ADA lawyer he believed scrupulous. He did not interview a single disabled person whose ADA claim he found to be meritorious. No disabled activists were interviewed — though a few, as described here, had their (partial) images used in the background footage. This was puzzling. 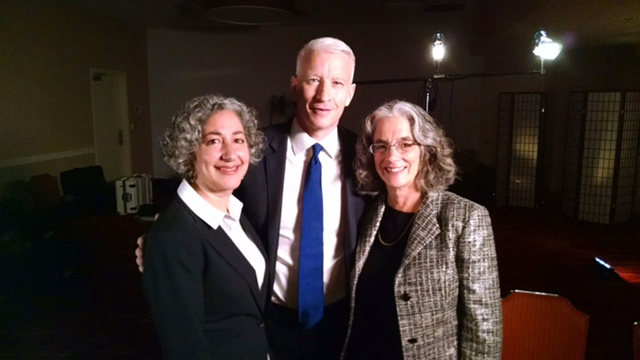 In June 2015 Linda Dardarian and I spent hours with Anderson Cooper and his crew for a 60 Minutes piece about the 25th anniversary of the ADA. The interview with Anderson Cooper went well. Cooper and his staff told us that they admired the work we do, and that they thought it was great that ADA enforcement was making the world more accessible to people with disabilities. After our interview we spent hours with the film crew demonstrating accessible technology the ADA had achieved. Experienced film makers carefully set up their high end equipment to get the perfect shot. The film crew came back weeks later to take footage of members of the disabled community doing things that ADA enforcement makes possible. The piece never ran. The ADA’s 25th anniversary came and went on July 26, 2015 without a word from the producers. When 2016 rolled around, we figured the piece was dead. We were disappointed, but know that media stories don’t run for any number of reasons. Why would 60 Minutes decide to run a negative story about the Americans with Disabilities Act now, eighteen months after filming? Why craft a story that left out hours of film and interviews about effective ADA advocacy. There can be only one explanation. Someone at 60 Minutes wanted an anti-ADA piece to support Donald Trump’s anti-regulatory, anti-ADA, and anti-disability agenda. The story that 60 Minutes initially planned to run had a very different message. Our hour plus interview with Anderson Cooper was wide ranging, covering ADA enforcement work we have done with our clients for more than twenty years. We talked, for example, about Talking ATMs achieved through Structured Negotiation, the alternative dispute resolution process that is the subject of my new book. If you look closely, you’ll see a picture of a Talking ATM at minute 12:53 of the video. That shot was taken while the 60 Minutes camera crew spent time with Jessie Lorenz, a blind activist in San Francisco who was involved in the negotiation. We encouraged 60 Minutes not only to shoot the background footage known as b-roll with our clients, but to interview these advocates as well. Lorenz, Executive Director of Independent Living Resource Center San Francisco and a single mom who has been featured in a Facebook promotional video, does not appear in the show. Anderson Cooper and his team were also very interested in the work that the American Council of the Blind has done in Structured Negotiation to convince national pharmacies to offer talking prescription labels. Back in Linda’s office, the 60 Minutes camera team spent hours filming the ScripTalk talking label system with a high tech robotic camera. Because of ADA enforcement through Structured Negotiation, this system is available through Caremark, Humana, Rite Aid, and other U.S. pharmacies. My picture of that filming appears in this post, along with the picture taken of Anderson Cooper standing between Linda and me. We knew that those hours of capturing the perfect shot would result in a few seconds of on-camera time, and that our engaging interview would be edited down to just a few minutes or less. We didn’t realize that the entire subject of ADA enforcement through Structured Negotiation would be left on the cutting room floor. Yet in truth, I am not upset that I did not make the final cut. The problem here, despite a few sentences praising the ADA spoken by Anderson Cooper, is that 60 Minutes killed a very different ADA piece in favor of 13 biased minutes designed to support an anti-civil rights Republican agenda. Structured Negotiation is just one way disabled people and their lawyers enforce the ADA, and Linda and I were not the only disability rights lawyers left out of the reimagined ADA piece on 60 Minutes. Lawsuits have played a critical role in fulfilling the civil rights law’s promise. The 60 Minutes producers were given names of lawyers across the country who work to enforce the ADA through lawsuits, administrative complaints, and other strategies. The national Disability Rights Bar Association is comprised of private and non-profit lawyers who represent disabled people using a host of strategies; court cases are a valuable tool in our tool boxes. But Anderson Cooper and his team chose not to put a single DRBA lawyer on camera. Instead, the show featured three lawyers — two being sued for malpractice, one that was sanctioned for what a court found to be unethical behavior. Plaintiffs’ lawyers have long been a target of the right in the United States. I guess 60 Minutes thought another hit piece was needed as political power in the country is shifting. The 60 Minutes episode didn’t just leave out the nation’s disability rights lawyers. One of the most hurtful aspects of the 60 Minutes video was its portrayal of disabled people and ADA issues generally. The disabled people Anderson Cooper chose to feature in his story were presented as dupes of unscrupulous lawyers. People who only became involved in ADA enforcement when lawyers contacted them. Like other civil rights laws, the Americans with Disabilities Act was enacted because disabled people took to the streets to demand their rights. Chained themselves to busses demanding transportation, filled the halls of congress with stories of exclusion and a thirst for independence. Today, 26 years after passage of the ADA, the disabled community is stronger than ever, with more grassroots organizations and social media skills than ever before. Not only was this activism nowhere in the 60 Minutes story, but 60 Minutes used b-roll footage of activists who believed they were contributing to a fair 25th anniversary story. Ingrid Tischer, Development Director at the Disability Rights Education and Defense Fund, is one of those advocates who we encouraged 60 Minutes to contact. Tischer’s body, but not her face or head, can be seen in the footage running during the story. When they dusted off the ADA story after the election and decided to twist it into an anti-ADA piece, someone at 60 Minutes decided that educating the public about the value of the ADA no longer mattered. Minutes 5:35 – 6:00 of the 60 Minutes Episode are made to order for Trump’s anti-regulatory agenda. First there is a picture of the ADA Standards for Accessible Design. Cooper tells listeners that the standards comprise 275 pages. He then goes on to mention various aspects of the built environment covered by the standards with plenty of images but zero context. Cooper shows a light switch, for example, with no mention that if mounted too high, a wheelchair rider cannot turn on a light when entering a room. He shows carpeting and pooh poohs regulations governing pile height, failing to explain that a manual wheelchair user will be unable to maneuver on improperly designed flooring. The ADA Standards for Accessible Design were not crafted out of thin air. They are based upon the experiences of disabled people and empirical studies. In many instances they represent compromise; some disabled people will still be unable to use aspects of the built environment that comply with the standards. The Standards for Accessible Design make the ADA a reality in the built environment. 60 Minutes and Anderson Cooper should be ashamed to ignore their true meaning to feed the Trump anti-regulatory agenda. Although Trump and Flake sparred during the run-up to the election, Flake’s bill fits neatly into a Trump vision of an unregulated business environment. 60 Minutes apparently thought that vision needed a boost with its biased and unfair story about ADA enforcement. This is a post about a television report that appeared on 60 Minutes. The story was about how lawyers are taking advantage of the Americans with Disabilities Act and filing too many lawsuits. The report was biased and unfair. It did not tell the full story and fed into Donald Trump’s anti-civil rights agenda. Last year the TV show interviewed Lainey Feingold and Linda Dardarian about ADA enforcement. They talked about accessible technology like Talking ATMs and talking pill bottles. The show shot film of disability rights advocates. None of this was part of the show.